With the Full Moon in Pisces on Monday, this week starts out with a bang! Neith already has written at length on this lunation, and I discussed it in last week’s forecast. Because the Sun opposed Uranus on Friday (Saturday in the Eastern Hemisphere), you may already have felt the impact of this volatile Full Moon, but with Uranus involved, it’s almost impossible to know. Hurricane Ike was an interesting manifestation of this Full Moon energy. This storm puzzled forecasters, because it wasn’t behaving like most hurricanes. In the days before landfall, they were getting inconsistent readings, and their forecasting tools were at odds, some showing that Ike would pass over warm currents and strengthen significantly, while others indicated passing over cold currents and weakening. In the end, Ike caused severe damage, but didn’t develop into a stronger Category 3 storm. Hopefully, that will be the case in our personal lives as well. And unlike hurricanes, which leave death, destruction, and personal tragedy, emotional storms can clear our lives of accumulated debris and set us on a new course more in line with our authentic selves. Mercury, Venus, and Mars all conjoined in Libra last week, which resulted in productive discussions, especially regarding relationships. A lot of anger may have been released, which I believe is a good thing in the long run, but some emotional turbulence may linger through this Wednesday, when the Moon in Aries opposes Mars, Mercury, and Venus all within a few hours. Keep talking, and don’t fear confrontation. Ultimately, it will help you grow and break through to higher ground. Indeed, barely two hours after the Moon opposes Venus, the planet of love forms a harmonious trine to Neptune, the planet of dreams and illusions. Which you get depends on whether you’ve done your work. Mercury trines Neptune on Friday, and Mars follows on Sunday. The bigger picture should come through now. There’s nothing like putting things in perspective to help you heal. Do keep in mind that Mercury turns retrograde next week, and so some of the issues you’ve been experiencing in your closest relationships likely will come up for rehashing and review for the next several weeks. Having a big picture for context will help us keep our sanity through it all. On Saturday, the Sun in Virgo squares Pluto in Sagittarius, putting practical considerations in conflict with religious and political beliefs. Expect a new round of campaign mudslinging, at the very least. Speaking of Pluto, the planet of death and transformation has just returned direct, as has Jupiter, the planet of expansion and good fortune. Breakthroughs should be happening for us left and right this week, in possibly miraculous ways. I sure could use a miracle, and wish the same for you. P.S. For more information on the upcoming Mercury retrograde, see my recent Saturday Extra post. 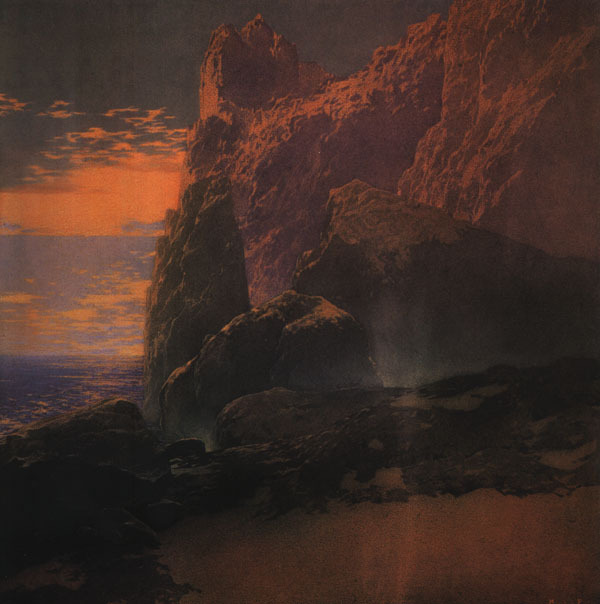 Image: The Tempest, by Maxfield Parrish, 1909. This entry was posted in Forecasts and tagged Full Moon in Pisces, Mercury retrograde on September 14, 2008 by Pat.